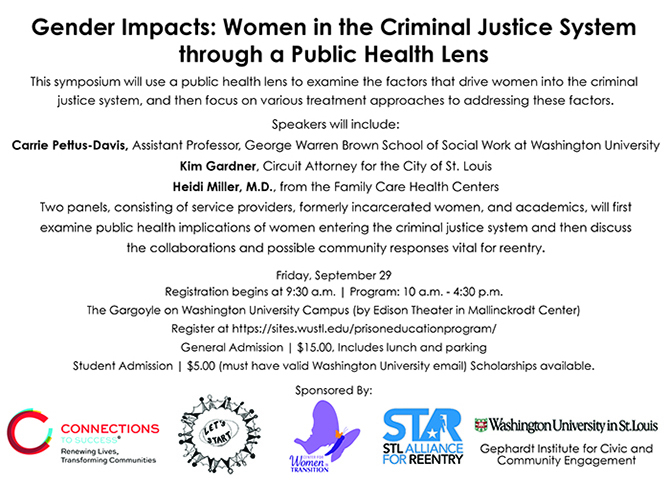 Don't miss the September 29, 2017 Women in the CJS through a Public Health Lens Symposium co-hosted by STAR at Washington University in St. Louis. The symposium will use a public health lens to examine the factors that drive women into the criminal justice system, and then focus on various treatment approaches to addressing these factors. $15 registration includes lunch and parking. $5 for students. The morning keynote will be offered by Kim Gardner. Prior to becoming the first African American Circuit Attorney in the City of St. Louis, Gardner served as an Assistant Circuit Attorney, and served two terms as a Missouri State Representative in the 77th District. More than 260 people attended the 2016 STAR Summit on March 15. This year's focus on young offenders featured presentations by Saint Louis University, ACT Missouri, St. Louis Drug Court, Missouri Division of Youth Services, St Elizabeth-Mother of John The Baptist Catholic Church, and the Urban League of Metropolitan St. Louis. A special thank you to this year's Summit sponsors: ARCHS, Lutheran Foundation of St. Louis, Missouri Department of Corrections, St. Louis Community College-Florissant Valley, St. Louis City, St. Louis County, and Washington University in St. Louis. On March 18, 2015, STAR hosted its sixth annual Reentry Summit at St. Louis Community College-Florissant Valley. More than 250 participants attended sessions on the social, emotional, and economic implications of returning home, and best practices for community reengagement. The keynote speaker was Eugene Schneeberg, Director of Center for Faith-Based & Neighborhood Partnerships, U.S. Department of Justice. He applauded STAR's unique community collaboration model and provided updates on several federal reentry programs. Other speakers included representatives from the City of St. Louis, St. Louis County, Places for People, Missouri Department of Corrections, University of Missouri-St. Louis, and Washington University in St. Louis.